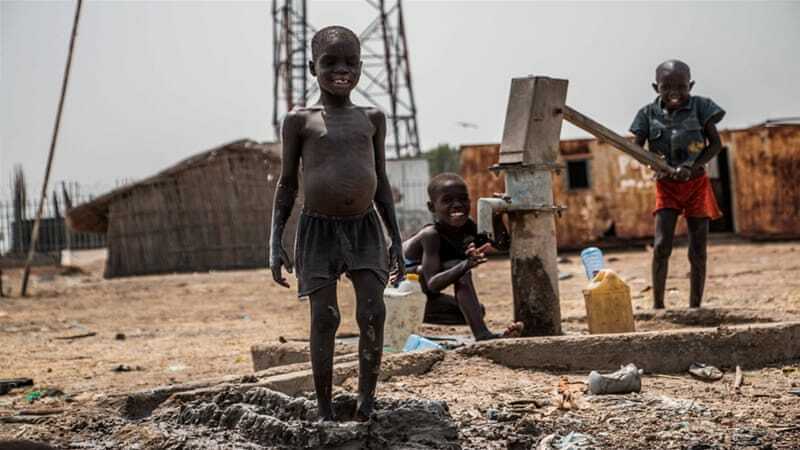 Oil's contamination of health and habitat in South Sudan This briefing takes a look at one of the world's great environmental time bombs - Big Oil's heedless and unscrupulous spewing of toxic wastes into the country's groundwater. Oil was discovered in what would become South Sudan in 1979. Production commenced in 1993. From the very outset there were concerns about the oil companies’ adherence to the environmental standards imposed on the disposal of the processed water ensuing from their pumping operations. Indigenous people consuming water taken from wells located in the catchment areas of the oil rigs began arriving at local clinics. The peoples’ health complaints ranged from nausea and skin problems to neurological disorders. The villagers also reported that the water in their wells had become salty, that it stank, and that their livestock and plants were ailing, even dying after having consumed it. In the early 2000s, local residents resisted their forced expulsion from their lands by oil companies and their governmental allies. South Sudan was recently ranked as the most dangerous country in the world for humanitarian workers - due to the world's highest rate of fatalities and other grave incidents. This comes with the assassination of a number of journalists who were striving to report on the links between Big Oil and the South Sudanese government. In 2008, Sign of Hope, a German NGO that supports two clinics in South Sudan, decided to launch an investigation. Conducted by Sign of Hope and associated scientists, this investigation comprised the making of field trips entailing the taking of samples of water in local wells and in catchment pits situated in the Thar Jath oil field. The samples of water and hair were then evaluated by laboratories of unimpeachable reputation. The findings: the water was contaminated with a witches' brew of heavy metals, salts and other noxious substances. The source of these was quite obviously the local oil field. Sign of Hope also delivered the 'smoking gun' proving the link between the desecration of the groundwater in and around the oil fields and the destruction of lives and habitats. This 'smoking gun' took the form of samples of local residents' hair, which international experts found to contain shockingly high concentrations of noxious chemicals. All told, some 180,000 local peoples have been exposed to the effects of this contamination. Since Thar Jath is only one of the ten oil fields in South Sudan, and since long-term and latitudinal effects have yet to be covered, the actual number of victims could well be in the millions. Perpetrators of this contamination include notably China National Petroleum Corporation, Indian company Videsh and Malaysia’s Petronas. Sign of Hope has been spearheading a campaign to convince the oil companies and their governmental and corporate allies to desist such practices, to remediate the environment, and to treat local residents’ ailments – and to provide them with compensation for their loss of life and livelihood. Affected by this contamination are the Sudd wetlands (one of the world's greatest sources of biodiversity) and the Nile, which creates and drains them. Needed is a full-scale, country-wide investigation, especially in view of South Sudan's plans to greatly ramp up the pumping of oil. Forms of mobilization: local residents have organized themselves into self-help groups that strive to make their communities aware - via talks, street theater and works of art - of the dangers of consuming poisoned water. As has been the case with efforts to find alternative sources of water, this self-help has been hampered by the hunger and fear plaguing most of South Sudan. They have caused millions of South Sudanese to flee. Project Details The facts on oil's contamination of one oil field - Thar Jath - of ten in South Sudan are contained in the abstract summarized below. To obtain an overview of the country-wide situation, satellites-generated images are now being analyzed. "High concentrations of lead and barium in hair of the rural population caused by water pollution in the Thar Jath oilfields in South Sudan." Pragst F1, Stieglitz K2, Runge H3, Runow KD4, Quig D5, Osborne R6, Runge C7, Ariki J8. In the oil fields of Thar Jath, South Sudan, increasing salinity of drinking water was observed together with human incompatibilities and rise in livestock mortalities. Hair analysis was used to characterize the toxic exposure of the population. Hair samples of volunteers from four communities with different distance from the center of the oil field (Koch 23km, n=24; Leer 50km, n=26; Nyal 110km, n=21; and Rumbek 220km, n=25) were analyzed for altogether 39 elements by inductively coupled plasma-mass spectrometry. Very high concentrations and a toxic health endangerment were assessed for lead and barium. The concentration of lead increased steadily with decreasing distance from the oil field from Rumbek (mean 2.8μg/g) to Koch (mean 18.7μg/g) and was there in the same range as in highly contaminated mining regions in Kosovo, China or Bolivia. The weighting materials in drilling muds barite (BaSO4) and galena (PbS) were considered to be the sources of drinking water pollution and high hair values. The high concentrations of lead and barium in hair demonstrate clearly the health risk caused by harmful deposition of toxic industrial waste but cannot be used for diagnosis of a chronic intoxication of the individuals. Development of Alternatives SIgn of Hope has called upon the government of South Sudan to vigorously apply environmental regulations, and has lobbied oil companies for them to cease and desist their violations of human and environmental rights, to remediate the environment, to drill deep wells, and to treat local residents for the effects of the damaging of their health - to no avail.